CANTON, Mass. (August 25, 2014) – September is prime pumpkin season at Dunkin’ Donuts, as America’s all-day, everyday stop for coffee and baked goods today revealed its harvest of new and returning pumpkin favorites for fall. Leading the autumn array are new Pumpkin Crème Brulee Coffee and Lattes, which are available hot or iced, featuring the delicious flavors of pumpkin and creamy vanilla blended together. 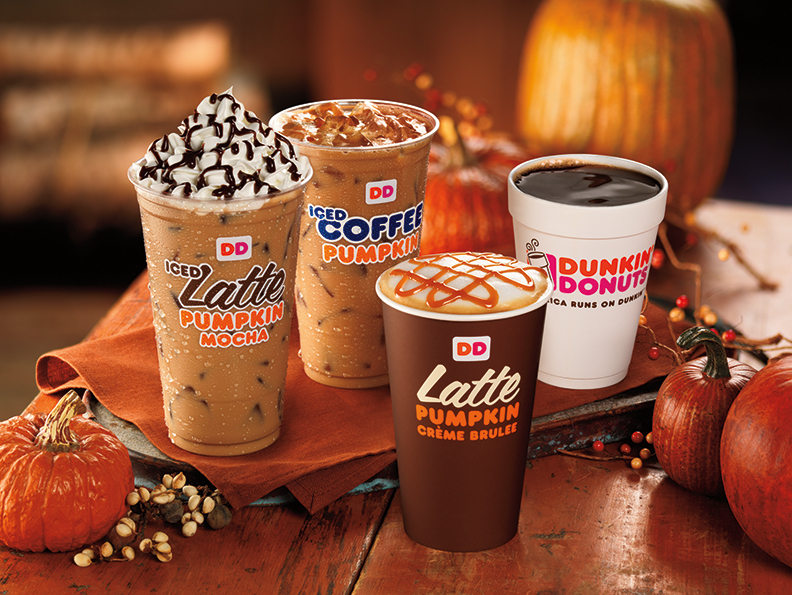 Dunkin’ Donuts is also bringing back a full fall lineup of pumpkin beverages and baked goods, offering guests one of the largest varieties of pumpkin options of any national restaurant chain. Dunkin's pumpkin lineup begins rolling into restaurants today, and all products will be available for a limited time by September 1. Pumpkin Coffee and Lattes: Dunkin’ Donuts celebrates the season by adding the taste of pumpkin to its world-famous coffee and lattes. Dunkin’ Donuts offers two varieties - Pumpkin or Pumpkin Mocha - served hot or iced. Pumpkin Donut and MUNCHKINS® Donut Hole Treats: Guests can savor the season with the glazed pumpkin cake donut, which can also be enjoyed as MUNCHKINS donut hole treats. Dunkin’ Donuts is also bringing its celebration of the return of pumpkin menu items to Twitter, with a special “PumpeDD for Pumpkin” Twitter Sweepstakes. Beginning today and continuing through Wednesday, August 27, fans can share which Dunkin’ Donuts pumpkin menu item they are most pumped to try this fall, using the special hashtag #PumpkinAtDunkinSweeps. All who participate will be entered for a chance to win one of seven $50 Dunkin’ Donuts mGifts. No purchase necessary, must be 18+ to enter. Void where prohibited. For official rules and additional information related to the “PumpeDD for Pumpkin” Sweepstakes, visit: http://dun.kn/1saDEbj. Dunkin’ Donuts guests can enjoy all of Dunkin’ Donuts’ pumpkin food and beverages at participating Dunkin’ Donuts restaurants through fall. And, Dunkin’ Donuts’ fall harvest isn’t complete today, as the brand plans to introduce a fun new pumpkin treat to its menu beginning in October. To be the first to know, follow Dunkin’ Donuts on the brand’s official Facebook and Twitter pages over the coming weeks. Finally, to spice up September, Dunkin’ Donuts is bringing back the Spicy Smoked Sausage Breakfast Sandwich. Ahead of cooler weather, this breakfast sandwich brings the heat with a spicy split sausage link with egg and American cheese, served oven-toasted on an English muffin. Available for a limited time at participating Dunkin’ Donuts restaurants nationwide, the Spicy Smoked Sausage Breakfast Sandwich joins the brand’s lineup of sandwich choices featuring breakfast favorites such as cherrywood smoked bacon, aged cheddar cheese, freshly baked croissants, bagels or toasted English muffins, providing delicious and satisfying options for guests to start the morning and keep running any time of day.